Hydroelectric Energy is almost all clean energy source comparing to all other renewable energy sources. Where Nuclear Power generates radioactive waste or wind energy generate noise, no such disadvantages observed in hydroelectric energy. This is why I denote, hydroelectric energy is a clean energy source. The prefix ‘hydro’ refers to water which is a pretty powerful source of energy. This you can also experience by standing below a waterfall or standing inside the flooded river. Water has been used to produce different forms of energy for a very long time. The history of hydropower started over 2000 years ago when water wheels were being used by the ancient Greeks to grind grain. Hydroelectric Energy was the prime thing at the beginning of the industrial revolution. It provided mechanical power for textile and engineering industries. As hydroelectric energy is important us, it is also important to know all about this clean, renewable energy. 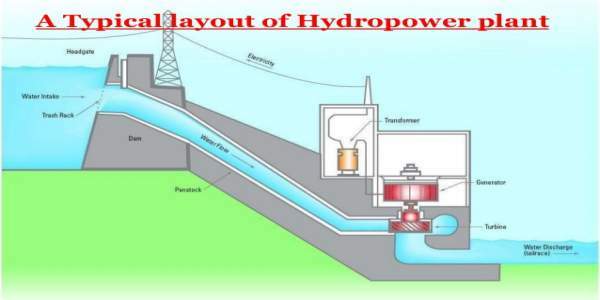 So, here you will find the information on what is hydroelectric energy, history of hydroelectricity, what is hydroelectric power, how do hydroelectric power work, advantages, and disadvantages of hydroelectric energy etc. Let’s start to go deep inside the topic to get all the information about widely used clean energy source called hydroelectric energy. The hydroelectric energy is that form of energy which is harnessed from flowing water. When electricity is generated from flowing water, this is called hydroelectric energy. Hydroelectric energy is considered a renewable energy resource because it ‘renews’ itself as it is used. This is not happened in non renewable energy source as like coal or gas or crude oil. About 19% of the world’s total electricity production comes from hydroelectric energy. That means a majority of our energy production comes from water. The hydropower station consumes no water, unlike coal or gas plants. Hence it doesn’t produce any direct waste or greenhouse gases. The average cost of hydroelectric power from a hydro station larger than 10 megawatts is 3 to 5 U.S. cents/kWh. This makes it a competitive source of renewable electricity. Hydropower or water power is power derived from the energy of falling water or fast-moving water. This power is harnessed for useful purposes. Since ancient times, hydropower in form of watermills has been used as a renewable energy source for irrigation and the operation of sawmills textile mills, domestic lifts, and ore mills. In India, water wheels and watermills were built, possibly as early as the 4th century BC. In the Roman Empire, water-powered mills produced flour from grain and were also used for sawing timber and stone. The modern hydro turbine was developed in the mid-18th century. In 1849, an engineer named James Francis developed the Francis Turbine, the type of turbine that is most widely used today. Then, in the early 20th century Victor Kaplan invented the Kaplan Turbine which helped develop the modern usage of low-head water turbine generators. In 1882, the world’s first hydropower plant begins operations in Appleton, Wisconsin, on the Fox River. The first hydroelectric plant opens in 1887 in San Bernadino, California. Today a vast expansion of hydropower’s potential is possible through new technologies. Hydroelectricity is the most commonly used form of renewable energy today, supplying about 20% of the world’s electricity. A hydroelectric power or hydropower is the energy of flowing water which is captured and turned into electricity. The basic parts of a hydroelectric plant include a hydro dam or reservoir, control gate, penstock, water turbine, generator, surge tank and a power distribution system. A principle of hydroelectric power generation is very simple. There are no other complicated reactions took place as to nuclear power. 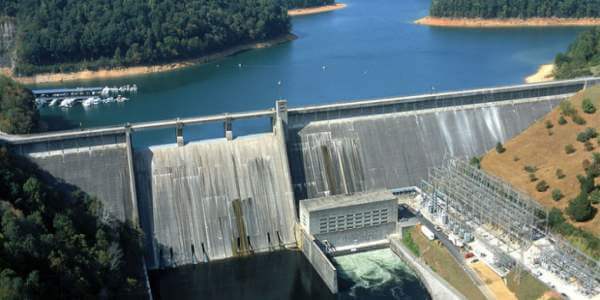 The most common type of hydroelectric power plant uses a dam on a river to store water in a reservoir. Water released from the reservoir flows through a turbine. The kinetic energy of flowing water starts spinning the water turbine. The mechanical energy produced by turbine stats rotating the generator. This activated generator produce electricity which is supplied to a power grid. The dam is constructed to ensure sufficient water storage at height. Hence dam forms a large reservoir behind it. The water head determines how much of potential energy is stored in a reservoir. The amount of water which is to be released in the penstock can be controlled by a control gate. A penstock is a huge steel pipe which carries water from the reservoir to the turbine. A turbine is a machine, mechanically coupled to an electric generator. The kinetic energy of the water drives the turbine and consequently, the generator gets driven. Impulse turbines are used for large heads and reaction turbines are used for low and medium heads. When the water turbine blades are rotated, it drives the generator and electricity are generated. This is then stepped up with the help of a transformer for the transmission purpose. A surge tank is a small reservoir or tank which is open at the top. It is fitted between the reservoir and the powerhouse. Let’s go further to see what are the hydropower advantages and disadvantages. First, we will see the advantages of hydroelectric energy then after disadvantages of hydropower. Hydroelectricity is generated from flowing water hence it does not produce greenhouse gases. So, hydropower is a clean energy source which is environment-friendly. Average hydroelectricity cost is very much low comparing to the cost of electricity generated by a thermal power plant. Hydropower plant doesn’t use fossil fuel. So, the non-renewable energy resources can be used for some more decades. The production of hydroelectricity can be increase or decrease as per demand. During pick demand, generation of power can be increased and during less demand, it will decrease. A hydro dam will increase the underneath water level of surrounding area. Hence chances of more water available through bore well or tube well for agriculture purpose. Impoundment hydropower creates reservoirs that offer a variety of recreational opportunities, notably fishing, swimming, and boating. Water is available in all countries so no country should depend on other countries, as it happens in the generation of nuclear power. The hydroelectric power plant doesn’t produce any radioactive waste as like nuclear power plant. Hence hydro plant does not pollute the soil. While preparing a reservoir by constructing a dam, many people have to relocate from their land. Hence they lose their homes, farms, and businesses. Shifting creates many social and physiological problems. Dams built blocking the flowing of water from one country to another or from one state to another. So, the water supply from the same river in the following country is out of their control. This can lead to serious problems between neighbouring countries or states. The building of large dams can cause serious geological damage. For example possibilities of earthquakes and has depressed the earth’s surface at its location. The flooding of large areas of land means that the natural environment is destroyed. Dams are extremely expensive to build. Hydroelectricity generation and prices are directly related to how much water is available. A drought could potentially affect the generation of electricity.